Michael Flynn is itching for some snitching. Or so his lawyers have led the president’s legal team to believe. On the night before Thanksgiving, Flynn’s attorneys notified Trump’s that they could no longer discuss the special investigation into Russian interference in last year’s election. The president’s lawyers took the call as a sign that Trump’s former national security adviser is, at the very least, negotiating with special counsel Robert Mueller over the possibility of turning state’s witness, according to the New York Times. That suspicion is sound. It’s common for defense attorneys representing different clients targeted by the same investigation to share information with each other. But once the interests of those clients diverge — say, because one is trying to rat out the other to keep his (large adult) son out of prison — then such chatter becomes unethical. If Flynn has decided to formally consider cooperating with prosecutors, then it would be standard practice for his lawyers to quit talking shop with Trump’s team. It’s possible that Flynn is merely in discussions with Mueller’s office, and that those talks will ultimately fall through. There’s also a small chance that Flynn’s lawyers are freezing out Trump’s for an entirely unrelated reason. But the evidence points to Flynn flipping. Earlier this month, NBC News reported that Mueller has enough evidence to bring charges against Trump’s former national security adviser. This makes sense: Flynn was on the Turkish government’s payroll for most of the 2016 campaign, a fact he failed to disclose until after he left the White House. Mueller has already indicted Trump’s former campaign manager Paul Manafort for similar failures of disclosure. Further, Flynn’s early exit from the White House was triggered by lies he told to the FBI. Last December, Flynn spoke to Russian ambassador Sergey Kislyak about U.S. sanctions against the Putin regime. In January, he told federal investigators that he had done no such thing. Unfortunately for Flynn, Kislyak was under routine surveillance by the U.S. government, and a recording of their phone call exposed his fib (eventually, the Washington Post did, too). Lying to the FBI is a federal crime, one that Mueller nailed former Trump campaign adviser George Papadopoulos for, before securing his cooperation. The special counsel is also eyeing Flynn and his son, Michael Flynn Jr., for offenses far more severe. 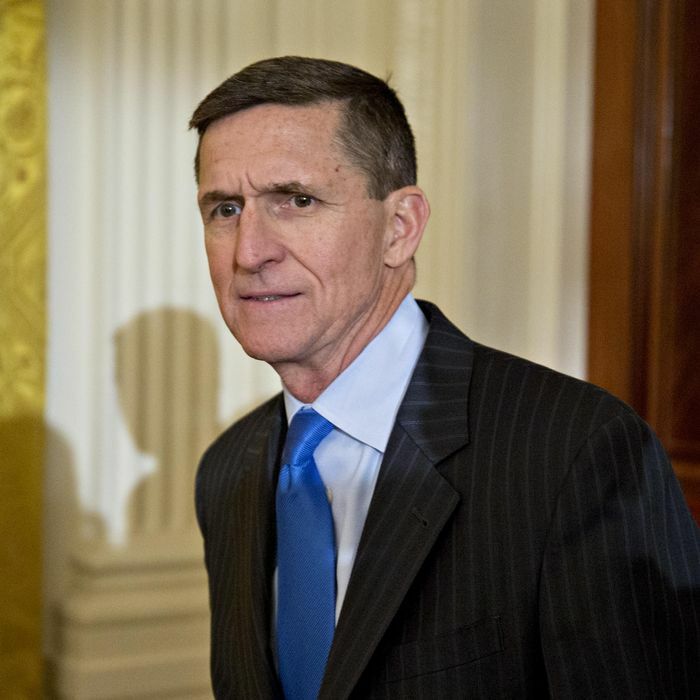 Last December, the Flynns allegedly took a meeting with agents of the Turkish government, in which they discussed arranging the extrajudicial rendition (a.k.a. kidnapping) of a legal U.S. resident in exchange for $15 million, according to The Wall Street Journal. That resident was Fethullah Gülen, the Turkish cleric turned American charter-school founder whom Turkish president Recep Tayyip Erdogan has blamed for the failed coup attempt against his regime in July 2016. At the time the coup was in motion, Flynn praised it. Erdogan might have been democratically elected, but he was also an Islamist with authoritarian tendencies, and thus, Flynn reasoned, his ouster would be “worth clapping for.” Then, the coup failed — and Flynn Intel Group won a lucrative contract with allies of the Erdogan regime. On Election Day, Flynn wrote an op-ed calling for Gülen’s extradition. Months later, as the incoming national security adviser, he was allegedly considering extraditing the Pennsylvania resident himself, with the aid of his son. According to the Times, Flynn has “expressed serious concerns to friends that prosecutors will bring charges against his son, Michael Flynn Jr.” in recent weeks. So, Flynn has plenty of motivation to make himself useful to the feds. And he almost certainly has information they’d find interesting. Flynn was an early high-ranking member of the Trump campaign, and played a lead role in the transition. During the latter period, Flynn and the president’s son-in-law, Jared Kushner, took a private meeting with Kislyak. Mueller is reportedly investigating that interaction.